The intron uses unique RNA motifs in order to select splice sites. An OH on the 5’-exon acts as a nucleophile, attacking a phosphate on the 3’-exon. Six phosphates from three RNA strands coordinate two metal ions (probably magnesium 2+) positioned at the reactive phosphate (3’-exon). This particular structure represents the state preceding the second step of splicing, at which the 5’-exon has been cleaved, but is still base-paired to the intron. The 3’-exon is still covalently bound to the intron, but also is helically base-paired to the intron. 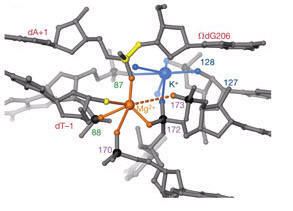 Figure displaying coordination of the active-site metal ions, Mg2+ and K+. These ions coordinate with the nucleophile, the leaving group, and scissile phosphorous. Note the high phosphorous density in the active site. Transition metals in this complex have been proposed to activate the nucleophile, stabilize the leaving group, and neutralize negative charges on phosphorous transition states.